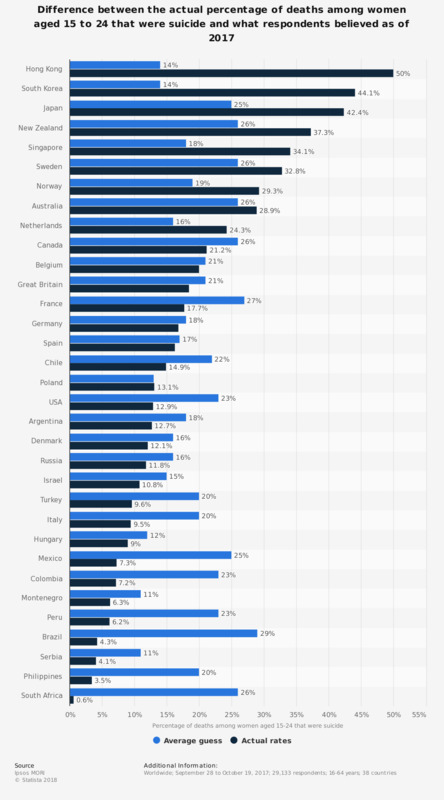 This statistic is based on a survey by Ipsos MORI and shows the difference between the actual percentage of deaths among women and girls aged 15 to 24 years that were suicide and what survey respondents guessed in select countries worldwide as of 2017. It was found that respondents in the U.S. on average guessed that 23 out of every 100 deaths among women aged 15 to 24 years were suicide, when in reality the number was 12.9 out of every 100. Original question: "Out of every 100 deaths of women and girls aged 15 to 24 in [COUNTRY], about how many do you think were by suicide?" In most countries the source used a source for the actual number of deaths that were by suicide that defines suicide as death by intentional self-harm (ICD-10 codes X60-X84). In the UK, the source used a source that defines suicide as death by intentional self-harm and also death caused by undetermined intent (ICD-10 codes Y10-Y34). This is because this is the definition of suicide used widely in the UK.